Hello there! Lauren Blair asked me to write a guest blog post for her while she's away. I was & am very flattered to be asked! 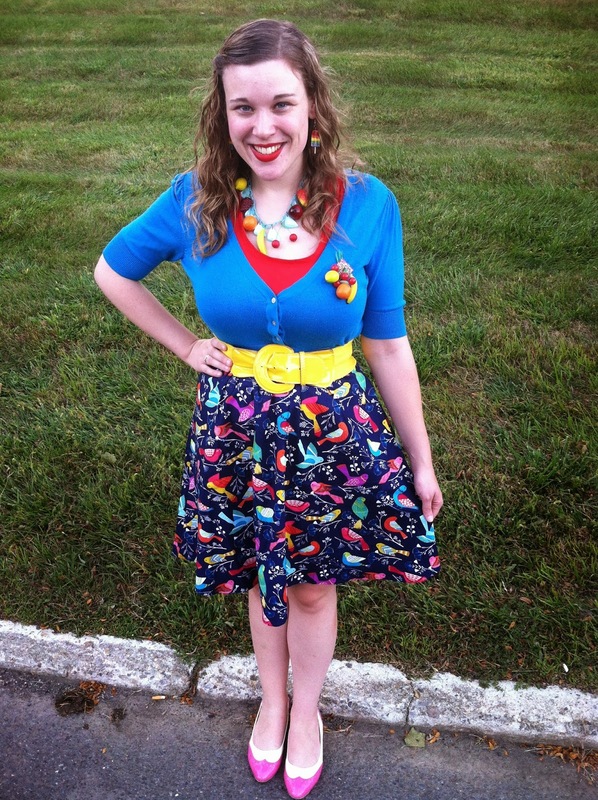 I really love her bold, fun, colourful style. We own a few of the same pieces, and adore some of the same brands, like Hell Bunny, Bernie Dexter, & Folter. She is one of my favourite people to follow on Instagram & has one of my fav blogs to read. She is such a sweet, adorable, inspiring lady! It was so great when I found out about fashin blogs. I started reading them over a year and a half ago, around the same I was really getting into Modcloth. I read them for a couple of months or so before deciding to start my own. I've been writing for a year and a half now. It's a creative outlet for me, I greatly enjoy it. I have an English degree, and have always loved to write, but hadn't been doing much writing in years. It's two of my favourite things combined: clothing/style & writing! My style has greatly evolved over the years. For most of my teenage and adult life I didn't dress "normal",or wear what was in style. The style I currently have, I have been rocking for about a year and a half now. 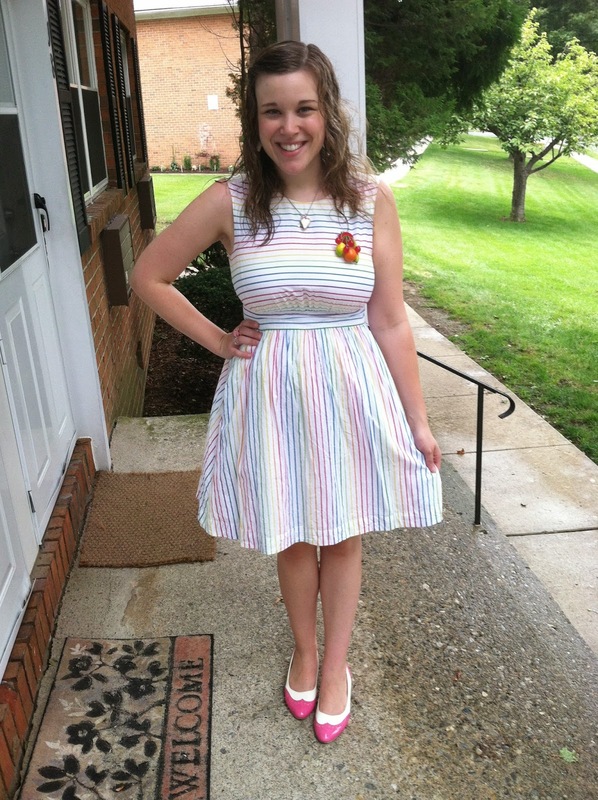 A year and a half ago I bought my first dress at Modcloth. And that's when my dress obsession began. One common thread is that I always loved bright colours. They have just always appealed to me. But, now I dress more brightly than ever before. I went through a phase in high school for probably about three years where I dressed "punkish". I did wear more dark colours than I ever have otherwise, but I also still had some brighter pieces, and definitely had bright purses and accessories. I wore a lot of plaid pants with zippers on them, punk band T-shirts, Dickies purses, chunky platform shoes, Converse, etc. I also weighed quite a bit more then than I do now (it's now been 10 years since I lost 45 pounds! ), so overall I looked a lot different than I do now. I also didn't know what make-up looked best on me, so I tried all different colours, especially with eye make-up. Now for make-up and clothing I know what is the most flattering on me. I work with my features and attributes, and know what to accentuate, and what shapes of clothing look best on me. I have come a long way, that's for sure! I especially love the 1950's style dresses, they work best with my body shape; the fitted chest and waist, and the full, flared skirt. I am a larger size on top than bottom, so this is the best type of clothing for my frame. I love the style I have now. It's hard to imagine not dressing like this. This just feels so completly "me." It's funny to hear comments I get on things I wear/my overall looks. I often hear (from people who don't know me), "you're dressed so bright today! ", "wow, you're really dressed up! ", etc. I definitely do NOT dress for attention. I am actually quite shy, and don't like being stared at, at all. But, wearing bright colours makes me happy. It sets my whole mood right, as soon as I get dressed in the morning. So, the reason I dress the way I do is purely for me and my own enjoyment. It's not always easy to find such brightly coloured clothing & accessories, I really have to hunt for them all over the Internet. I used to shop so much at malls, I went every week or every two weeks for years, but now I never go! Luckily, my mother is an excellent seamstress, and she has made me seven dresses in the past year! I love looking for colourful fabrics online for her to sew for me. There is such an enormous selection out there! I always have to have everything match. That's just me! I can appreciate when other people do not have everything matching though. My jewelry and shoes always match my clothing. Another trademark of my style is that I wear A LOT of food items! 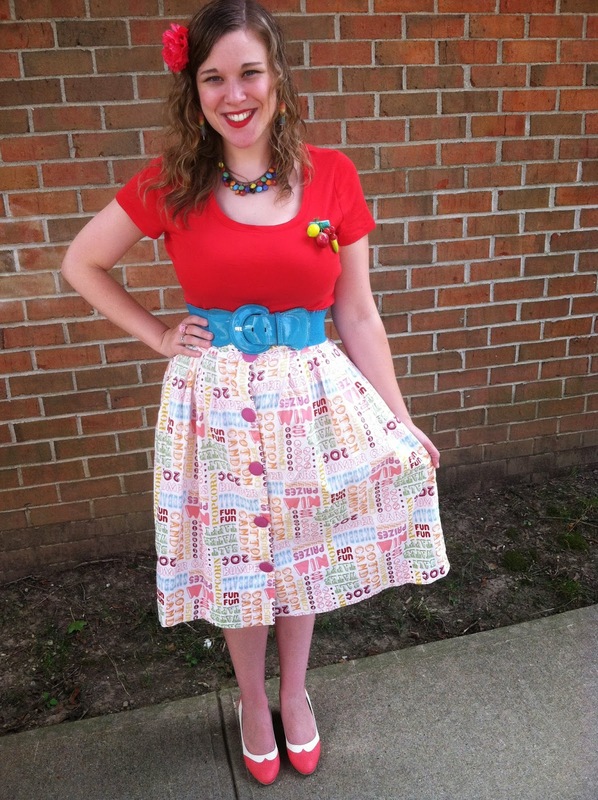 I have many food patterned dresses, and also have lots of food jewelry! I can't get enough of Luxulite brooches & necklace. I have quite a few of her fruit ones. 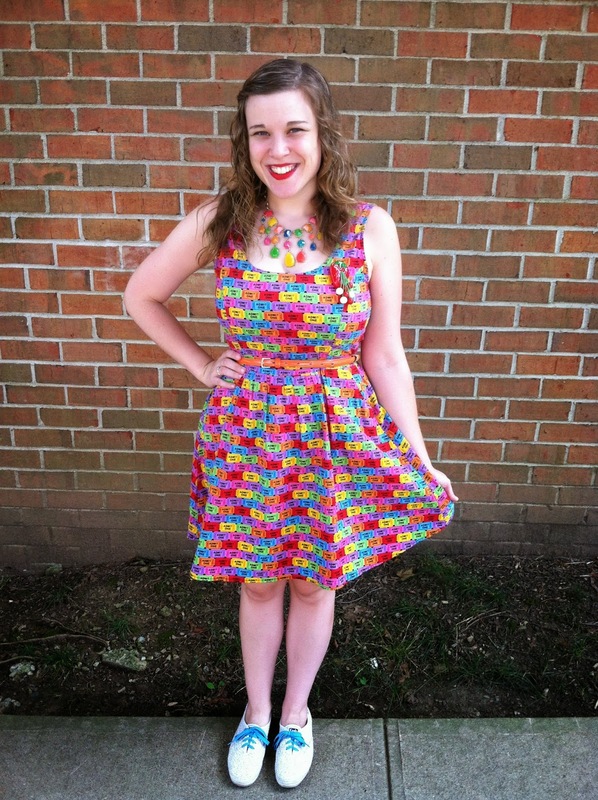 Luxulite is an Etsy shop, and the woman behind it is named Katy. I highly recommend her! I wear her accessories every day; I don't feel complete without one of her items on. I have two favourite outfits. I can not pick one over the other, ha! 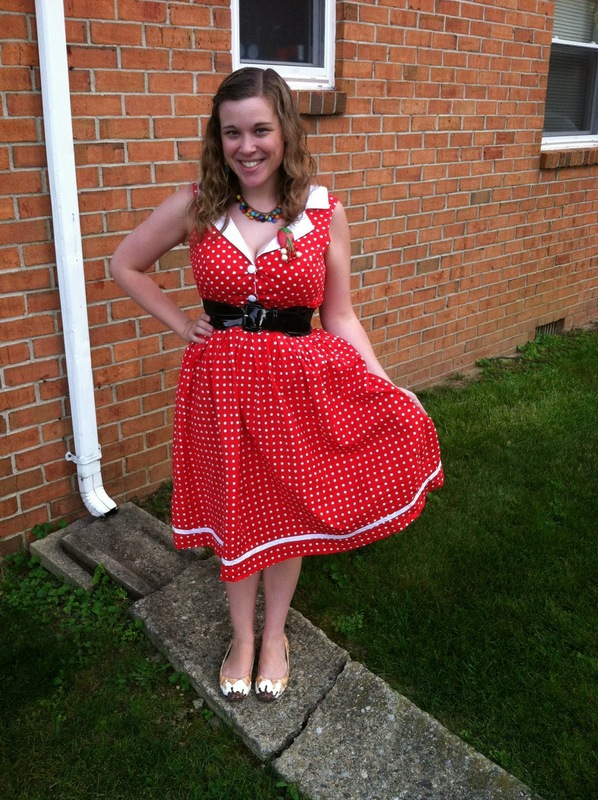 First off is my Folter brand dress I bought at Modcloth. 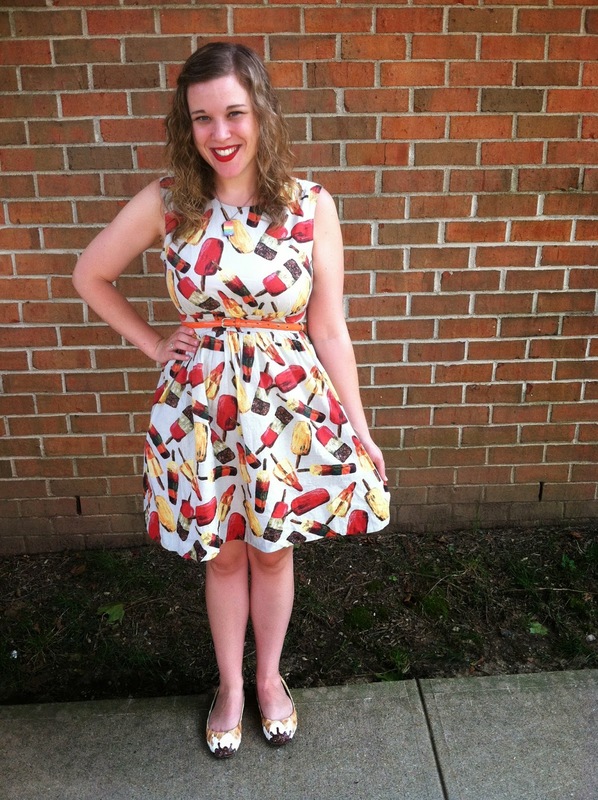 It has a junk food print on it. I actually hemmed & hawed for months before ordering it. When I ordered it, I couldn't believe I had ever waited so long! I adored it instantly. 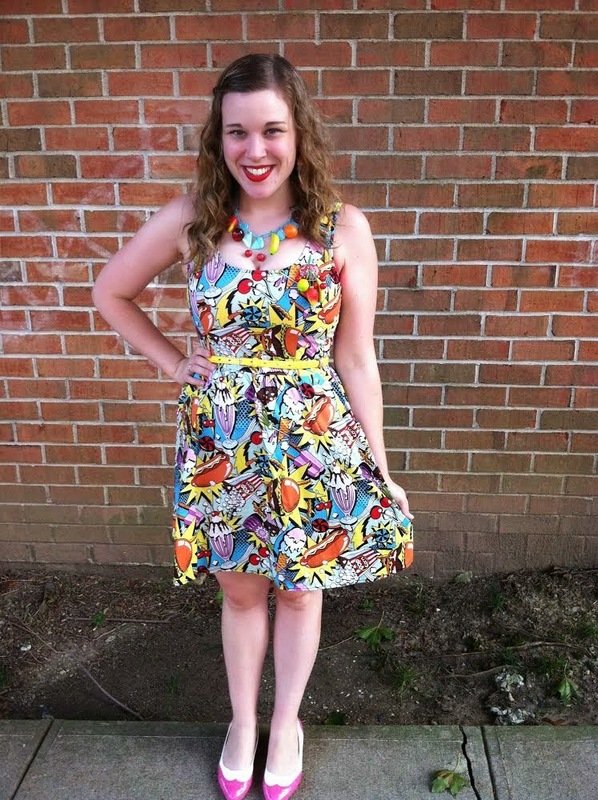 I think the print is just so darn cute & fun! It's as bright as can be, and that's perfect for me. It also has such a great shape, and is very flattering on my body type. 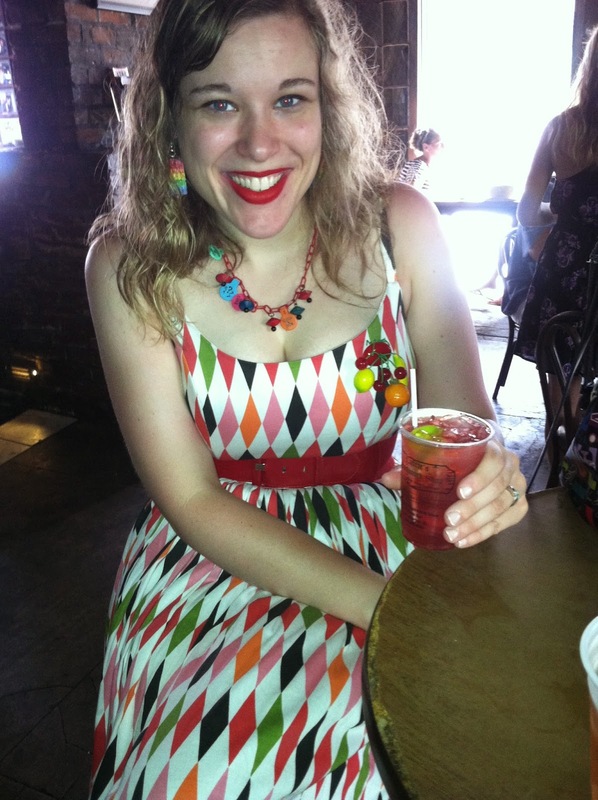 My other favourite outfit is my Pin Up Girl Clothing Jenny dress in the oranges print. My favourite colours are orange and pink, by the way. Orange clothing is not always the easiest to come by! 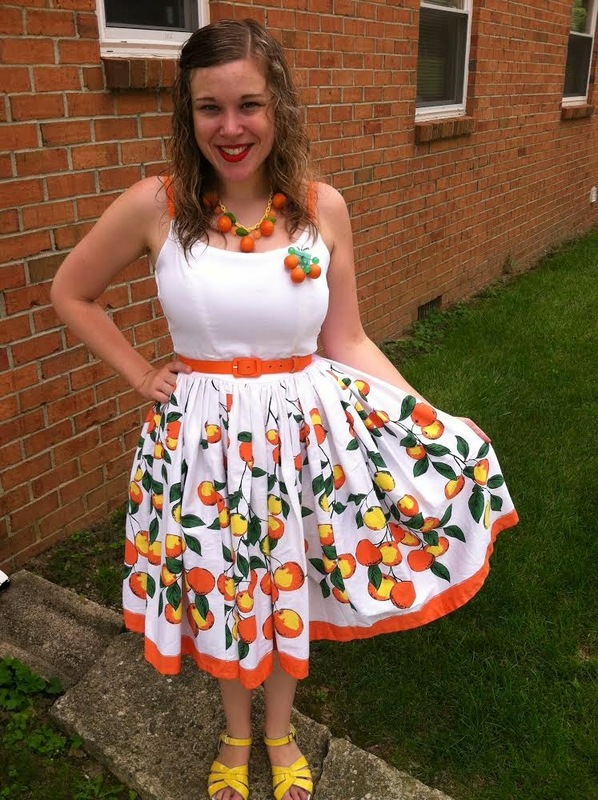 My oranges necklace & oranges brooches (I have two) pair perfectly with this dress! 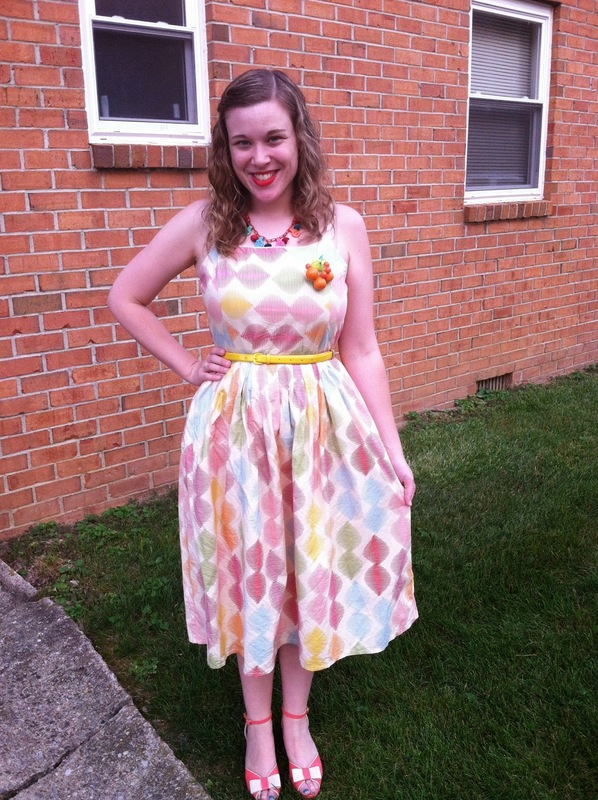 I love that there is also yellow in the skirt, so the dress pairs perfectly with yellow shoes. Thanks again, Lauren! :) Loved writing this for your blog! Hope you've had a great trip home. Thank-YOU! Hope to meet you next time!!! It was so interesting to learn a little more about you, Bristol! I never would have guessed that you had a punk phase in high school (but didn't we all?) I love reading your blog, so it was really nice to learn a little more about the girl behind the screen!